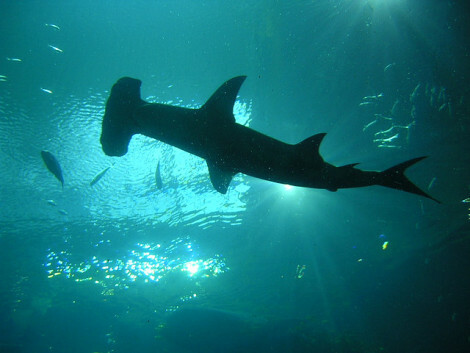 The great hammerhead shark, the largest species of hammerhead sharks, is locally endangered in some parts of the world. Animal activists are pushing to have this shark federally protected via the Endangered Species Act to keep the massive carnivore from going extinct. Great hammerhead sharks and other hammerheads are a fairly common species in the north and western Atlantic Ocean, their numbers have plummeted around Africa and European waters. Whether hammerheads are caught unintentionally, as they are by American fisheries, or intentionally, by poachers who carve off the shark’s large and meaty fins for soup, the mighty fish is becoming a rarer sight around the world. Note that the practice of shark finning (deliberately fishing for sharks, chopping off their fins, and releasing the disabled animal back into the ocean to drown) is illegal in American, European Union and Australian waters. 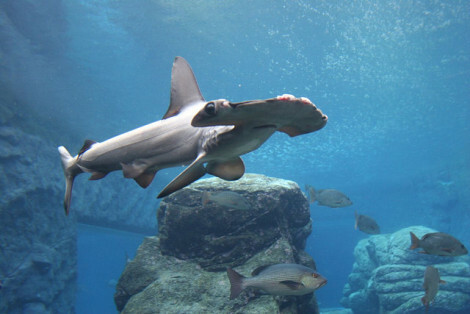 The National Marine Fisheries Service has formally filed a petition with the United States government to label both the great hammerhead and the scalloped hammerhead as officially endangered, thus giving them full federal protection under the Endangered Species Act. Click here to read the lengthy document and support the movement by leaving supportive comments. Even though great hammerhead sharks have the potential to be killers, there has only been a single fatality from a hammerhead shark attack recorded in the history books. These 20 foot long sharks consume a huge variety of marine life including fish, stingrays, octopus, crustaceans and smaller sharks. No, Virginia, There Isn't An Easter Bunny?